Rock units forming the Edwards and Trinity aquifers in northern Bexar County, Texas, are exposed within all or parts of seven 7.5-minute quadrangles: Bulverde, Camp Bullis, Castle Hills, Helotes, Jack Mountain, San Geronimo, and Van Raub. The Edwards aquifer is the most prolific ground-water source in Bexar County, whereas the Trinity aquifer supplies water for residential, commercial, and industrial uses for areas north of the San Antonio. The geologic map of northern Bexar County shows the distribution of informal hydrostratigraphic members of the Edwards Group and the underlying upper member of the Glen Rose Limestone. Exposures of the Glen Rose Limestone, which forms the Trinity aquifer alone, cover approximately 467 km2 in the county. This study also describes and names five informal hydrostratigraphic members that constitute the upper member of the Glen Rose Limestone; these include, in descending order, the Caverness, Camp Bullis, Upper evaporite, Fossiliferous, and Lower evaporite members. This study improves our understanding of the hydrogeologic connection between the two aquifers as it describes the geology that controls the infiltration of surface water and subsurface flow of ground water from the catchment area (outcropping Trinity aquifer rocks) to the Edwards water-bearing exposures. 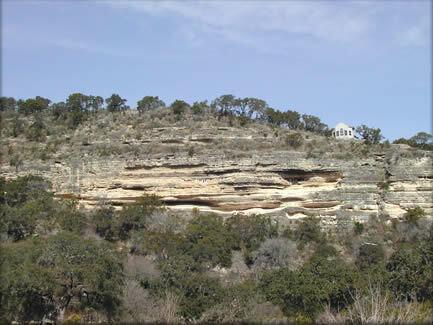 Photograph: View of the upper member of the Glen Rose Limestone exposed north of San Antonio, Texas. Contains: geospatial database. Refer to the Readme and Metadata files for more information. Clark, A.R., Blome, C.D., and Faith, J.R, 2009, Map showing the geology and hydrostratigraphy of the Edwards aquifer catchment area, northern Bexar County, south-central Texas: U.S. Geological Survey Open-File Report 2009-1008, 24 p., 1 pl.